Jake Walk, Limber Leg Blues. By 1930 tincture of Jamaica Ginger had been around a long time. As early as the middle 1800s, essence of ginger root extracted into alcohol was an official product listed in the United States Pharmacopeia. Ginger extract was used for maladies such as dyspepsia (upset stomach, indigestion), runny nose and to promote menstrual flow… in some cases, especially dyspepsia, it was reasonably effective. Much of the ginger was produced in Jamaica and imported to the US, where it was processed into a tincture by mixing five grams of ginger (powder or resin) per milliliter of alcohol… yielding a concoction with a minimum of 70% — to as much as 90% –- alcohol. 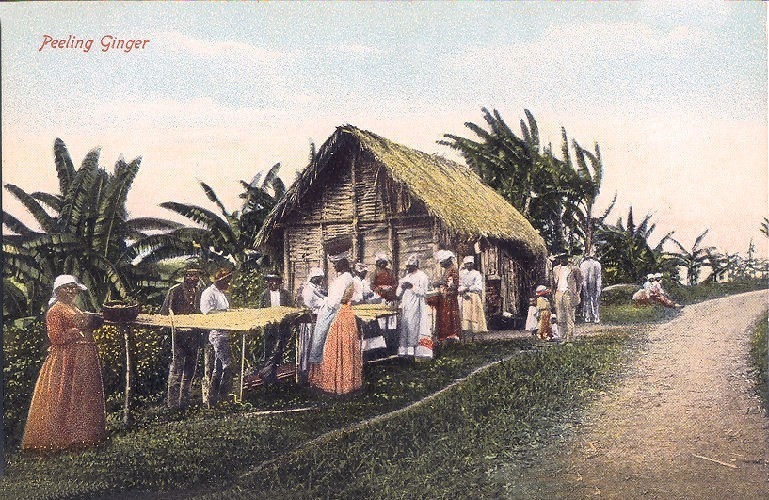 Extract of Jamaica Ginger – formulated to be taken a drop or two at a time – was, in effect, a bitter and unpalatable 160 proof drink, two ounces of which would contain the equivalent of four shots of whiskey. However, as long as alcohol beverages were readily available, there was no need to use Jamaica Ginger as an alcohol source or substitute. This all changed in 1919 when, following the ratification of the 18th Amendment to the Constitution, the National Prohibition Act (aka the Volstead Act) was passed by Congress. This Act prohibited the manufacture and sale of beverages which contained alcohol — leaving one massive loophole… alcohol could be used in preparations which were designated for medicinal and other non-beverage uses. Those with economic resources could readily find imported or bootleg alcohol to meet their needs, and those with fewer resources – but who lived in more rural settings – could depend on their needs being met by friends or family with a neighborhood whiskey still. This left others, especially the hard-core alcoholics among the urban and small-town poor, to find less savory alcohol-containing products, and they turned to what was available, including; Sterno (canned heat), shoe polish, perfumes, after-shaves and alcohol-based medications such as Jamaica Ginger extract (or jake, as it was known on the street). 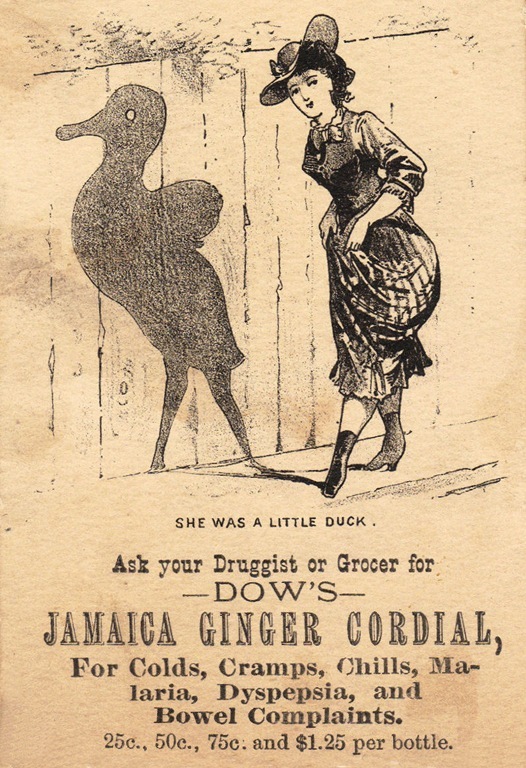 In an effort to increase sales by making their product more palatable to the alcohol-seeking consumer, a number of producers of Jamaica Ginger extract sought to find ways to reduce the bitter taste of the product by reducing the amount of ginger and replacing it with a chemical which had similar properties and which would pass what meager inspection was being done by governmental agencies. Initially, the adulterant of choice was caster oil… difficult to detect and tolerable to consume. But caster oil was not cheap and a residue could sometimes be detected in the neck of the bottle. Other chemicals were sought. In 1928 two Boston brothers-in-law, Max Reisman and Harry Gross, petty criminals and bootleggers, set up a full-time business producing and wholesaling Jamaica Ginger extract; and almost from the beginning they sought ways to cut corners and maximize their profits. By mid-summer 1929 they were looking to replace the castor oil adulterant in their product, and after a good deal of trial and error … and black-market research, they settled on a chemical known as Lindol (or TCOP), a fuel additive and plasticizer used in paints. Lindol met their needs for being non-detectable, and was thought to be harmless, having been tested on monkeys and dogs with no ill effects to either of those species. In January, 1930 Gross and Reisman bought enough Lindol to produce six hundred and forty thousand bottles of contaminated Jamaica Ginger. They shipped the tainted product within a month and the untoward effects of their crime became evident almost immediately. In late February, 1930, patients began showing up in doctors offices and hospitals with an odd set of symptoms… they were initially seen in Oklahoma – but soon in scattered areas throughout the entire nation east of the Mississippi: Johnson City, Tennessee; Wichita, Cincinnati, Topeka, Mississippi, New England, Rhode Island. The number of impacted individuals is thought to be roughly 50,000 to 100,000, with many tens of thousands of cases of permanent paralysis. The jake-poisoning symptoms, once acquired, were for the most part, life-long and improved only rarely, in a very few cases. It is little wonder that the jake leg epidemic became fodder for the “event song” on 78 rpm records. Event songs were a common genre of vernacular music… a type of “newspaper of the air” that often told the stories of catastrophes such as train wrecks, murders, floods, wars, cyclones, epidemics, ship sinkings, kidnappings and the passing of celebrities such as Will Rogers or Rudolph Valentino. Timeliness was important in event songs and the case of tainted Jamaica Ginger poisoning was no exception. In fact, the songs describing jake poisoning played an important informative role in spreading the news about tainted jake and limiting the epidemic. 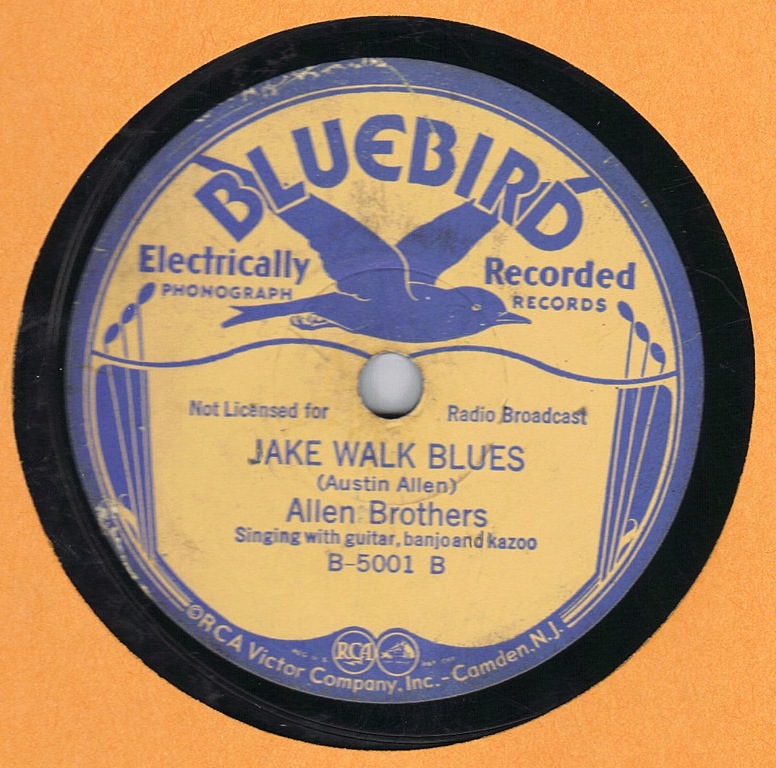 Allen Brothers “Jake Walk Blues” was initially released on the Victor label in late spring or early summer of 1930, then released on Victor’s discount Bluebird label in 1933. 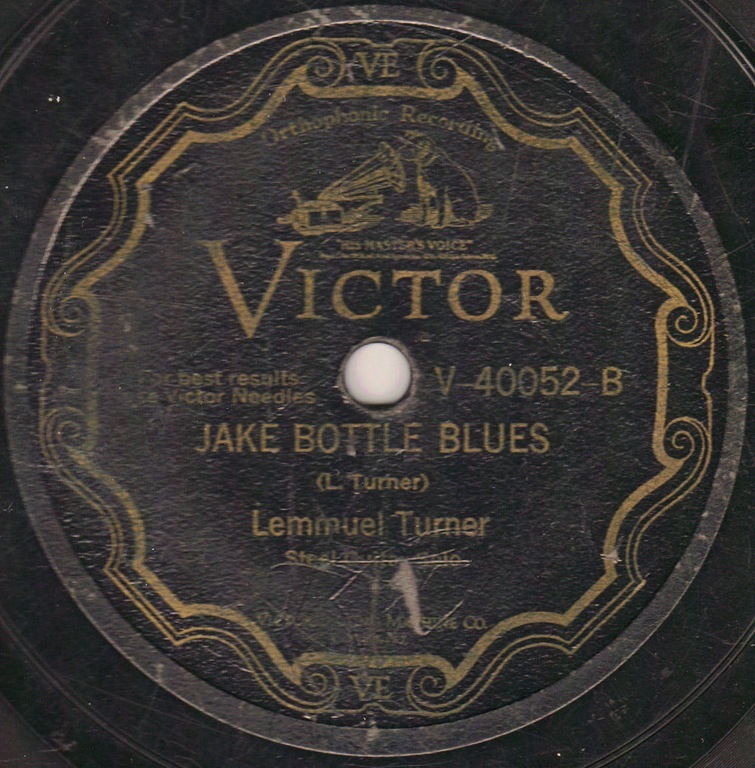 Although Jake had been mentioned as an intoxicant in song prior to the epidemic, the first post-poisoning 78 rpm jake leg song to hit a Victrola was Ishman Bracey’s “Jake Liquor Blues” on Paramount 12941, recorded in March or April of 1930, some sixty to ninety days after the first documented case of Jamaica Ginger extract poisoning. 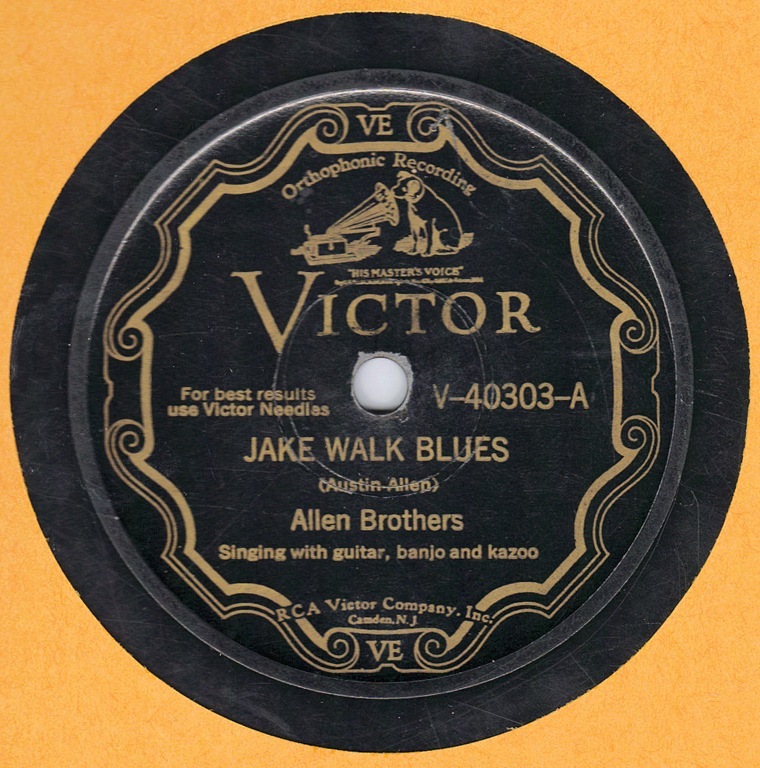 That was quickly followed by the Allen Brothers Victor 40303 recording of “Jake Leg Blues” on the 5th of June, 1930 and Narmour & Smith’s recording of “Jake Leg Rag” and “Limber Neck Blues” on June 6th, 1930. The Mississippi Sheiks great “Jake Leg Blues” on Okeh followed on June 10th, 1930. Byrd Moore’s Gennett 17091 recording of “Jake Leg Blues” on September 7th, rounded out the first wave of 1930 recordings. Narmour & Smith: “Jake Leg Rag” (June 6, 1930, Okeh 45469). Instrumental. Narmour & Smith: “Limber Neck Blues” (June 6, 1930, Okeh 45548). Instrumental. Dave McCarn & Howard Long: “Bay Rum Blues” (May 19, 1931, Victor 23566). Two April 2012 additions to the Vernacular::Shellac archives. The records look pretty beat up, but both play better than they appear… two nice instrumentals. The above 78s are all more or less valuable to collectors, owing, in part, to the subject matter and the inherent popularity of the recording artist, e.g. Tommy Johnson… as well as to the slow record sales during the Great Depression which severely limited phonograph record production and sales. I would add that the average value of collectable 78s has increased significantly since Osborn’s 2008 Q&A column ..… by perhaps as much as 25% to 50% — or more. The Autry and Hopkins 78s and the Black Ace LP, which Osborne did not mention, are significantly less valuable than the other 78s… they are perhaps in the $20 – $50 range. 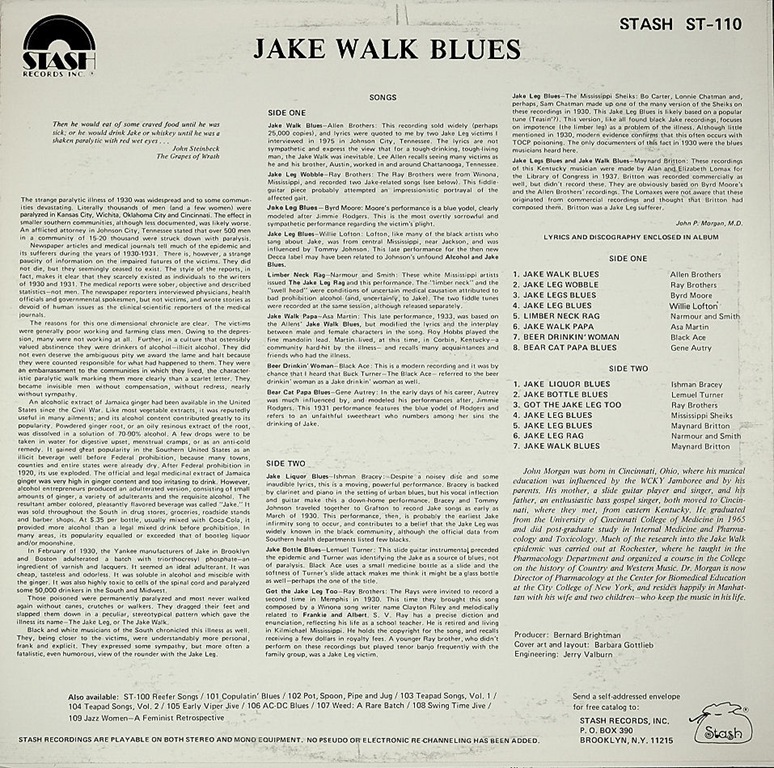 In 1977 the Stash Record Company of Brooklyn released Stash ST-110, Jake Walk Blues, a 15-song compilation including the majority of jake-related songs released on 78 rpm records. However, one song is conspicuous by its absence; Mississippi Sarah & Daddy Stovepipe’s: “Jake Leg Blues” (October 21,1931, Vocalion 1676). Not only is it not to be found on Stash-110, it does not appear to have been re-released in any medium and may not be available in any format today. While the majority of these songs appear on CD reissue (especially in the Document catalog) The 1977 the Stash LP record is long out of print and has not, to my knowledge, been re-released on digital media. It’ll paralyze your dindong too. I’m a jake walk Daddy with the jake walk blues. 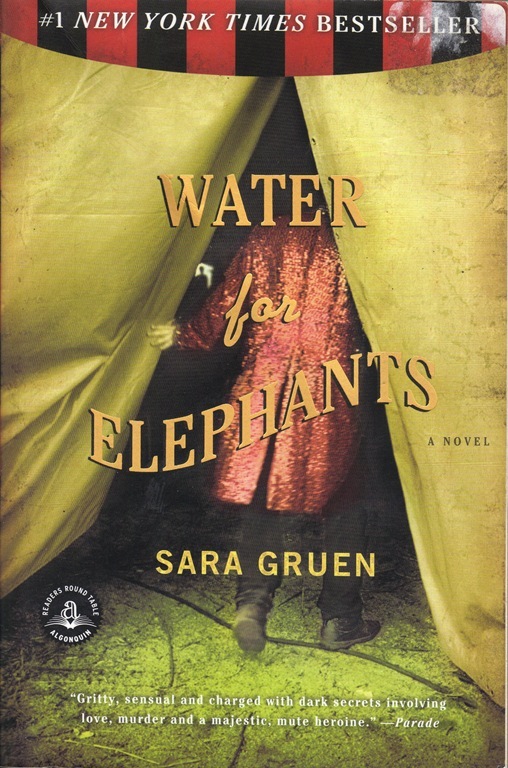 Although Woody does not make an appearance, a Woody Guthrie type character would have fit right into the great 2006 novel of Depression Era circus life, Water for Elephants, by Sara Gruen. One of Gruen’s important secondary characters is a man who’s circus name is Camel. Camel is a functioning alcoholic who would find his drink where he could and jake was one of his sources. One of the book’s plot lines has Camel falling victim to jake leg, and his handicap is such that the circus management can not tolerate his drag on their bottom line and he faces the danger of being tossed… (literally), off the circus train. Jacob, the book’s main male character, is befriended by Camel early in the story and Camel is instrumental in Jacob’s getting a job with the circus. How Jacob supports and protects Camel after he succumbs to the ravages of jake poisoning reveals much about Jacob’s character. He passes me the bottle. “What the hell is this?” I say, staring at the brackish liquid. “It’s jake,” he says, snatching it back. There’s a good deal more jake related information and action to follow, and if you’ve not yet read Water for Elephants, do yourself a favor… it’s a great story and Gruen does a terrific job of capturing life on the fringes during the Great Depression, and of weaving the jake leg story into the heart of vernacular America. 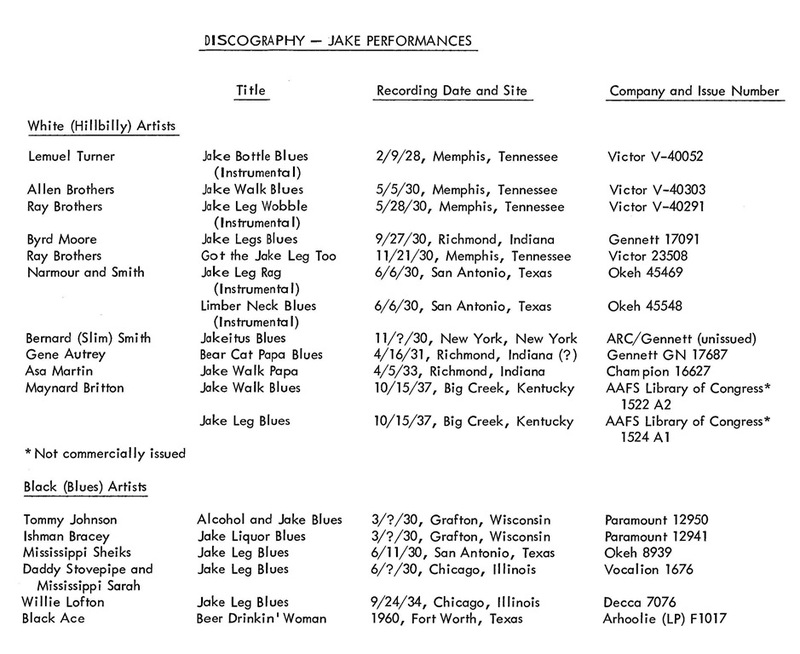 In doing research for this posting, I would like to give all due credit to the late Dr. John Morgan, lover of early American vernacular music and tireless investigator of the jake leg tragedy and its relationship to blues and hillbilly tunes released on 78 rpm records. Dr. Morgan was a professor at the City University of New York Medical School who, over thirty-plus years, collected the known 78 rpm releases which document the jake leg epidemic of 1930 – 1931. In addition, he researched the epidemic itself and met with a number of the survivors of Jamaica Ginger poisoning. Outstanding post but I was wondering if you could write a litte more on this topic? I’d be very thankful if you could elaborate a little bit more. Many thanks! Thanks for the kind words. 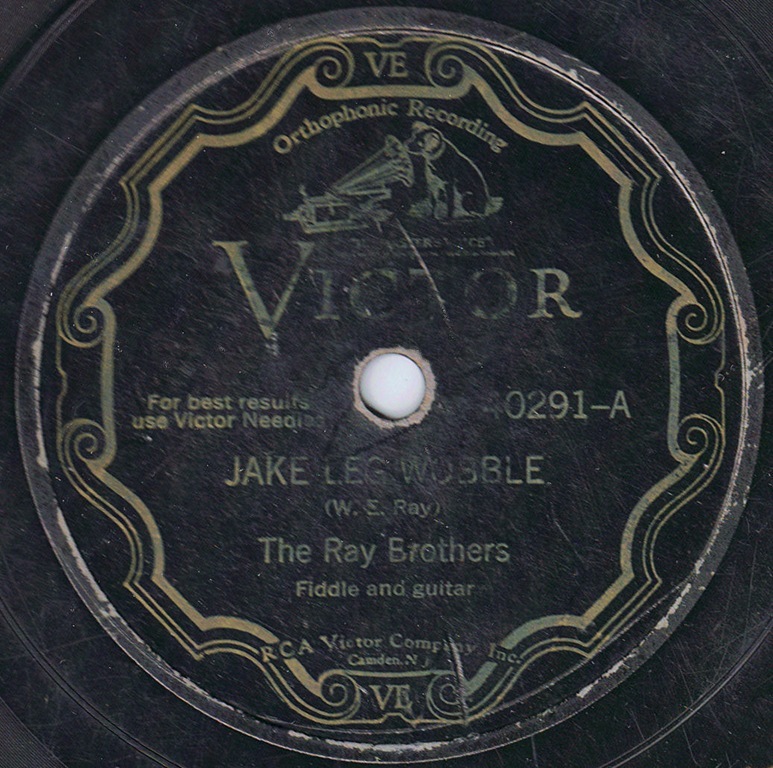 As I come across additional information relating to the Jake Leg epidemic and 78 rpm records I’ll update the post. I have had the Stash LP for many years but my copy never had the insert, so I was interested to see the excerpts. Is it possible to acquire a copy or download of the insert, or can someone scan & email it to me? It would be much appreciated. Hi Malcolm, Glad you enjoyed the “Jake Leg on 78 rpm records” blog entry… I’m happy to oblige with the Stash LP “Jake Walk Blues” insert. Thanks for the fantastic blog entry. Very well done! I’ve been listening to blues records from the 1920s and 1930s since I was in high school in 1980. 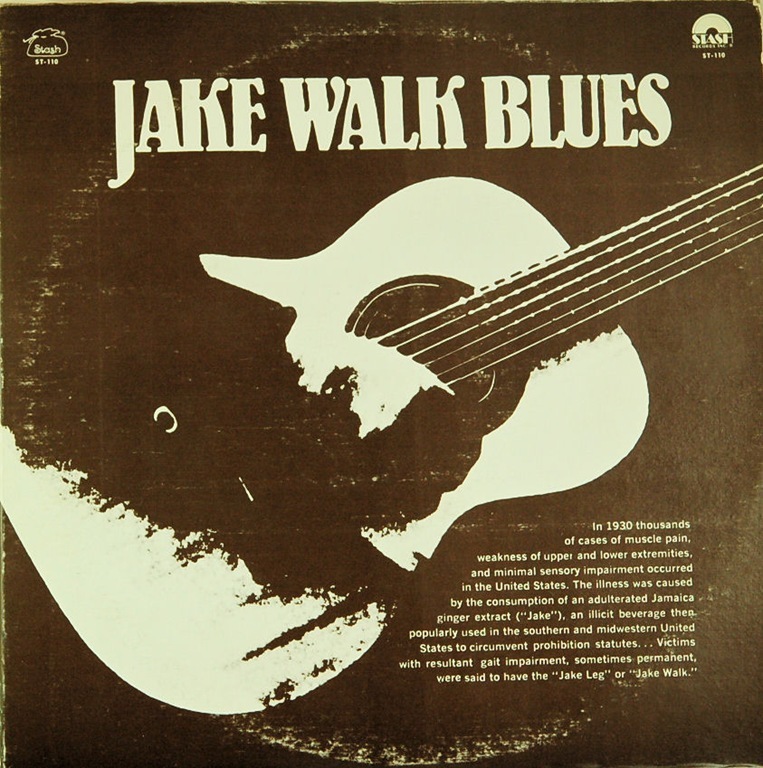 I remember seeing the “Jake Walk Blues” album on Stash in the racks of my local record store but over the course of a couple of years I always passed on it. Up until now, everything I knew about “Jake Leg” came from the liner notes on that album. In the late 1980s I found a 78 rpm copy of the Mississippi Sheiks’ “Jake Leg Blues” (Okeh 8939) at a junk store on the south side of Chicago (it’s by far the best 78 I ever found). My iPod served that song up to me today while “shuffling.” That prompted a Google search, where I found your wonderful post. Thanks again! Lee, Sounds like we have similar interests in music… and I’m pleased you enjoyed my entry on “Jake Leg.” I hope you’ll find some of my other blog entries interesting as well!